Sam’s love of newsprint clashes with her love for the planet—and her BFF—in a Dear Know-It-All conflict of newsworthy proportions! 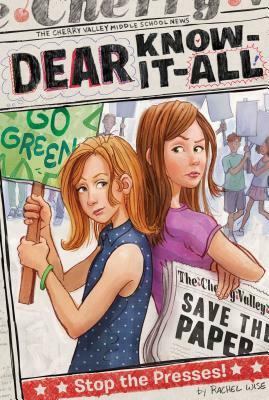 When Sam hears Cherry Valley Middle School is “going green,” she is delighted. Saving the Earth is very important to Sam, plus, she knows she can get a great story out of it. But that’s before she finds out one of the environmentally friendly suggestions is to stop printing The Cherry Valley Voice! Who would dare to suggest that the school newspaper be published only online? When she discovers the idea came from her BFF, Hailey, Sam gets even more upset. How will Dear Know-It-All solve this total disagreement?